Wow, The Legend of Korra has been giving us everything we want lately: likable antagonists, battles that play with the bending elements in interesting (and sometimes terrifying) ways, and Korra and Asami working as a perfect team. So in the confusion of Comic-Con and the sudden move to Korra online, I have tragically missed not one but two weeks of recaps, so let's catch up, shall we? First, we learned that Suyin's advisor Aiwei is in league with Zaheer's gang. Then we learned the gang's name: the Red Lotus. The Red Lotus' goal is to dismantle all the world's governments and plunge humanity into what they believe is the universe's natural state: chaos. It's interesting that Zaheer names Unalaq as a former member of the Red Lotus and is disappointed in Unalaq's decision to put personal power over ideology, because it mirrors our own disappointment with Unalaq. Zaheer is everything we hoped Unalaq would be: a smart extremist who genuinely hoped to win Korra over to his cause. Plus, unlike Unalaq, he's loyal to his allies. Seriously, I would watch a show that was just about these characters. 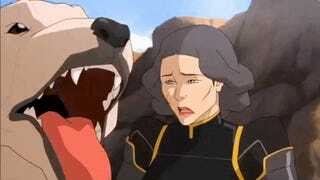 It's easy to see why Bolin gets along with Ghazan so readily and why he's impressed by the Red Lotus' Lavabending. The writers have taken great pains to make the Red Lotus work as a functional team whose powers play off each other well and who are creative fighters. They are also doing a nice job of connecting the threads of this season. We hoped that Korra wouldn't be able to ignore the corruption of the Earth Queen in Ba Sing Se, and now Zaheer has taken matters into his own hands while pointing out that while Aang might have painted Airbending as the art of floating and flying, it is actually a terrifying ability. Bravo, Zaheer. You've also given Korra a very human problem to deal with. How will she bring a semblance of order to the chaos of Ba Sing Se? Well, first she has to escape her captors. Korra and Asami really are perfect partners, and not just because they're both beautiful women who are more interesting when they're not kissing Mako. It's because they complement each other so well. Korra is the incarnation of the mystical, while Asami is a native of the technological. Korra tends to solve problems with martial power while Asami is more of a problem solver. And while Korra is earnest to a fault, Asami can finesse her way through a situation. That's why, when Korra is bound up like Hannibal Lecter aboard one of the Earth Queen's airships, Asami is able to use her sweet-talking and her ability to recognize a shoddily attached fixture to free them both. 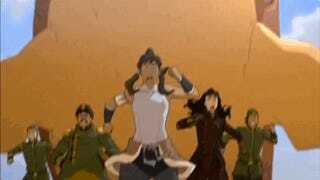 Korra uses her Airbending to take out their captors and Asami fixes the busted airship. Like the members of the Red Lotus, they have each other's backs. Sure, one of them might screw something up (usually Korra), but the next step isn't blame; it's figuring how to deal with the problem at hand. That's especially important when a giant monster bursts from the desert sands. This is why Korra has gotten so much better at winning hearts and minds at this point in the show. She is more and more the Avatar that we have always wanted her to be.